If ever a quote were truer for me, it is this one. I was in Baltimore for a conference, where an international consortium of accessibility professionals descended upon the Hilton in Baltimore. I was truly empowered, uplifted and inspired to keep on fighting the good fight, no matter how much longer I need to be on the front lines of the battlefield. Unfortunately, my patience and fortitude to stay with those feelings came crashing down around my ears when I made the attempt to get to the airport to catch my flight home. Kevin a fantastic compliment to Hilton's attention to hospitality and customer service, had seen me coming across the lobby of the hotel. He immediately said "Hey Albert, where you heading sir?" I let him know we need to get our bags from the valet and that we were heading home. So, off he went to collect my things and told me he would meet me outside in a few. I went out to the front of the hotel where Keith had been waiting to get me a taxi to the airport. Keith had been out front most days during my stay and had always been available to point me and Vaughn in the direction of that plot of grass which Vaughn so desperately needed throughout our stay. Keith ushered me toward a beautiful black SUV. Just before we got into the car, Kevin came out with my bags and we all said our good byes, and I anticipated a smooth and on time arrival at the airport. Unfortunately, that did not happen. The driver got into the car, and stated that he cannot take dogs. No good afternoon sir, no how are you doing today sir, just a statement letting me know we were in for a bumpy ride. 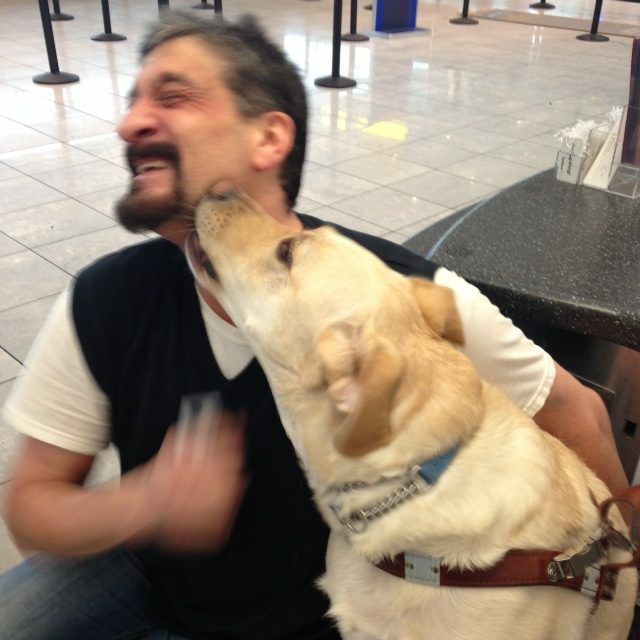 I let him know that the dog was a service animal and that I was blind. That fell on deaf ears. He tried to assert that his company did not allow dogs in their cars, and that he could not take me to the airport. I took immediate offense to this, and advised that it was against the law to deny me service and that he just needed to take me to the airport. This assertion of my civil liberties, my rights as protected under the ADA went over like a lead balloon. The young man then asserted he knew of no such law, and that it was his car and that I needed to get out. Needless to say, I lost it. The driver removed my bags from his trunk and put them back on the curb. He then flung open the car door and insisted I get out of the car, which I loudly and with a number of colorful words refused to do. This got the attention of Keith, Kevin and just about anyone and everyone within a one block radius of my voice. The man tried to argue with the valet that he did not have to take me anywhere and that he was not taking a dog in his car under any circumstances. Of course Keith let him know that legally he had to, much as I had advised, but this man, ignorant to the laws protecting my rights, insisted he did not need to either follow them, or questioned their existence. I could tell that English was not this man’s first language, which lead to my surmising that he was not born here, had recently immigrated here, and might not be as clear about the laws as he needed to be. Admittedly I got caught up in the emotions of the moment and asked what if anything he knew about the laws governing the rights of the disability community, and assuming he came here to enjoy those freedoms, why the hell was he attempting to deny me mine? I demanded that the police be called, that the General Manager be called, and that I be able to file a complaint with the appropriate authorities to ensure that the Hilton’s dedication and attention to uplifting and respectful treatment of ALL their Guests be followed, even by service providers pulling up to the front of their establishment. I was so livid. Keith and Kevin called hotel security and soon I was speaking with William about the incident. All the while I am still in the car, not at all sure where my personal belongings were and stressing over the real possibility that I might just miss my flight and be stranded at BWI. William tried to defuse the problem, and attempted to calm me down. He started out by asking me what happened, and I summed it up in a few words as best I could, fighting back my emotions. I forget what he said, but William intimated he needed to get the driver’s version of what happened, which pissed me off to be honest. I leaned into William and said, “You are Black right?” to which he answered yes. I told him I totally understand why Black Lives Matter, and empathized with him and my brothers and sisters in the various communities are struggling in the 21st century, to be respected and valued. I told him that Disability Lives Mattered too. I equated my feelings in that moment with the prejudice and ignorance that impacts race relations in this country today. I told him I understood why we had to name the movement Black Lives Matter and not All Live Matter, because if ALL lives did matter over the last number of centuries for my sisters and brothers where the shade and hue of their skin was not bleach white, we would not be where we are as a society when it came to inclusion. To that end, the disability community has been dealing with being marginalized, disenfranchised, and often times institutionalized because of our differences. Unfortunately, the mistreatment and dis’ing of the ability of those of us who are differently abled has been going on for millennia. If you do not believe me, just take a look into any book of worship and let me know what you find about the disabled and the down trodden. If I learned anything from the Civil Rights movement, is that where voices are quieted because of systemic socially imposed ignorance and inability to accept people at their face value, the louder the cry needs to be from that community being segregated and held down. Just like the Who’s down in WhoVille said, “We are here, we are here, we are here!” Needless to say, William got it, and actually thanked me for drawing the similarities in how I felt to how he has been made to feel because of societal presumptions and impositions rooted in ignorance. As luck would have it, the owner of the car service was on site and immediately took over the discussions and was extremely upset by what had happened, by how I was treated, and by my obvious upset and extreme discomfort with what I was put through. His name was Kason, I am sure I am not spelling it correctly. Kason had actually been in front of the hotel a number of times that week and had even reminded me about how he guided me toward the trash can one morning. Needless to say, his calm, apologetic and sincere attitude toward my plight, calmed me and allowed me to come back to center and get out of the car. I insisted on finishing my incident report with William, with security at the hotel, and let him know I was disappointed with the lack of response to my call to the police in this instance. Assuming they had more serious issues to attend to, I signed the report and agreed to head to the airport with Kason hoping to make my flight, or any flight for that matter. I must note, that when William came up to me with the incident report, he apologized and said it was a hard copy and that he understood I would not be able to fill it out, but that he would be all too happy to fill it in for me. Love that guy. I also must credit this particular Hilton for the attention it lent to signage and accessibility overall. Perhaps the topic for my next blog. Thanks Hilton! Immediately upon pulling away from the hotel, Kason, an Ethiopian American, continued to apologize. He let me know how he knew the ADA laws, and that he trained his drivers in accepting and respecting the same. Hell, I would think he had to since the national headquarters for the National Federation of the Blind is headquartered in Baltimore. Our discussions turned to the driver and his youth. Kason told me he was a good man, and had no explanation for why things went as they did. He assured me that the man had no right to represent himself as the owner of the car let alone the owner of the company. Kason had been supporting his family, his wife and their three children, with the account at the hotel for 25 years. The Hilton account was very important to him obviously, as was forgiveness and education. He asked me what I wanted him to do with the driver after a bit of discussion about many things. Knowing how terrible things were in their country, and how they came here to America for life, liberty and the pursuit of happiness, I asked Kason to discipline the young man as he deemed appropriate, but that he was not to fire him from his job. We decided that his anger about my knowledge of the law, which seemed to trigger his own insecurities and or pride in his misunderstanding of the law, seemed to have put him on the defense immediately. Perhaps it was my explosive response to his ignorance and honestly, I have to own some of the influences that caused things to unravel as they did. So, as we pulled up to the airport, we agreed to keep in touch, and Kason invited me back to speak with and meet the driver in the near future. I was concerned about the young man taking his ignorance and leaving Kason’s employ and our not being able to gain another convert for acceptance and inclusion if we were to cut him loose. I hope that Kason does write to me as I felt a bond with this man in those 35 minutes we drove together. Kason insisted on guiding me to the ticketing counter, for which I was grateful. As luck would have it, my plane was further delayed, and we were able to make our flight home! So, what are the take aways? I know I am an Ambassador of sorts, but I need to try being more diplomatic when confronted with challenges and ignorance’s like the challenges I faced with the driver. I need to work harder on being patient and I need to call on my fortitude more. I also realized that standing up for what is right is not always easy, but it must be done. I learned, once again, that many other people know what is right and, when called to stand with you, they almost always do. I had no choice. I had to run the risk of missing my flight and educating this driver, Kason, and even the staff at the Hilton. I know that William, who I called and thanked profusely once I got to my gate, has a tremendous amount of respect for my struggles, and we both identified with how sometimes, the general public has, for centuries, overlooked some lives that did not conform to what was considered “normal”. This is the 21st century. Such ignorant and discriminatory practices should not be allowed to continue. Ignorance of the law is not an excuse people. So, this unfortunate incident had a number of silver linings that is for sure. This being my first blog, and believing we are all in this together, if anyone has a topic they would like to put out there for a future blog please feel free to put ideas out there. If we are going to change the world and make it more inclusive and accessible to ALL people, we must remember we are one TEAM, which stands for Together Everyone Achieves More!